Unique lighting solutions individualize each of the restaurant’s table settings. Photo by Ryann Ford. A corner booth at the front portion of the dining room. Photo by Ryann Ford. Lighter chairs reinforce the glazed entry’s connection to the exterior patio. Photo by Ryann Ford. 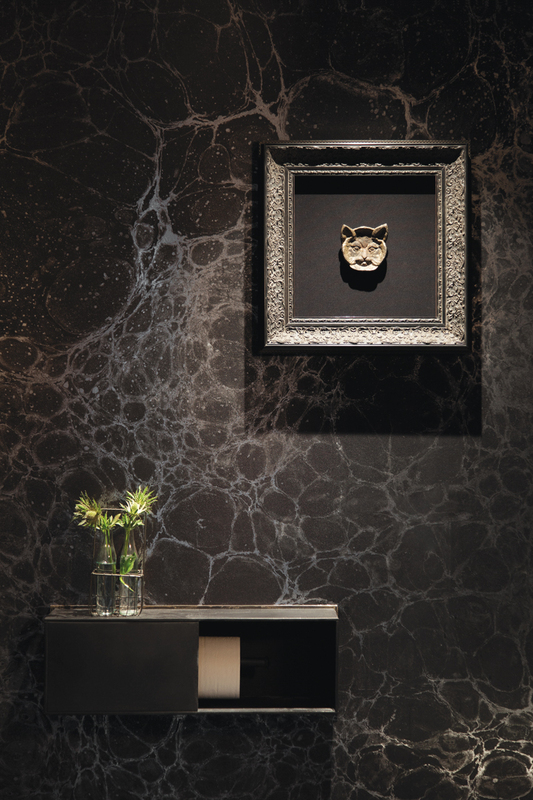 Each unisex water closet is furnished in a dark but eclectic style, with a variety of wall treatments, light fixtures, and objects of interest. Photo by Ryann Ford. The private dining room is rendered in a dark plaster with a vaulted ceiling. The fittings throughout strike a balance between refined and edgy. Photo by Ryann Ford. Drive east on Cesar Chavez and Austin’s adolescent skyline shrinks in the rearview mirror. This is the Holly neighborhood, and along this street, unlike other eastern thoroughfares laden with new mixed-use construction, the area has remained contextually intact. Here, new businesses inhabit existing buildings. 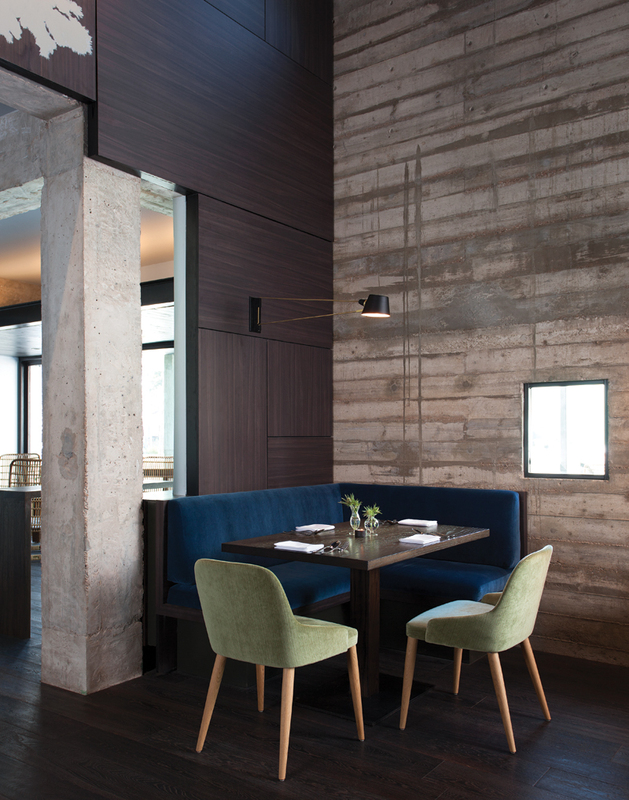 Such is the case for Juniper, a Northern Italian-inspired restaurant designed by Sanders Architecture with Cravotta Interiors. The restaurant is in a hip warehouse renovation at Cesar Chavez and Pedernales: The structure used to be a bottling plant but is now home to a synthesizer shop, a sour beer brewery, and an architecture coworking space. Juniper was conceptualized as a black box theater where culinary drama takes center stage, and the resulting space is vibrant and rewarding. If food is the star, then Yanes is the stage manager coaching its performance from the wings. Sanders said they tested different kitchen layouts but in each the chef’s sightlines through the space were essential. Standing at “the pass,” where complete plates are inspected before being delivered to patrons, the chef maintains full view of the entrance, dining room, and kitchen. 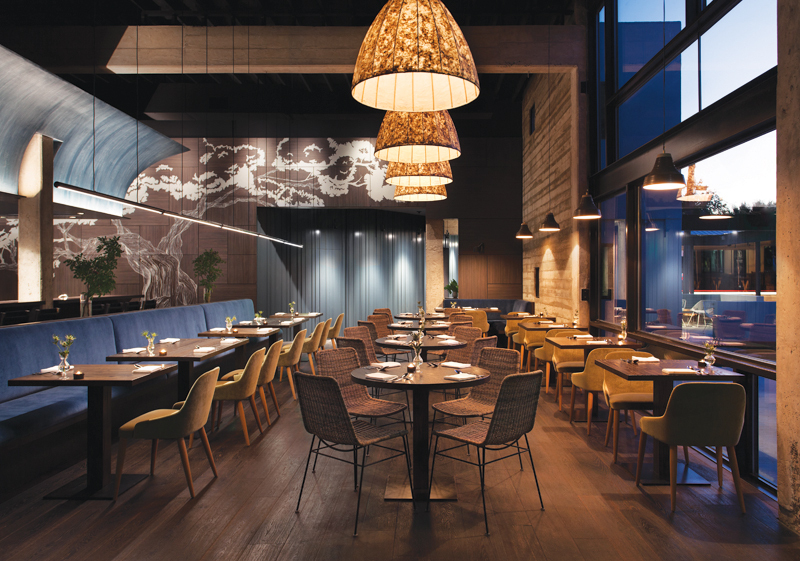 The strategic location allows Yanes to make eye contact with guests when they arrive, to monitor the progress of every ticket, and to keep close tabs on the kitchen’s preparations as his team assembles the night’s feast. Juniper’s spatial drama begins with a compressed entry sequence: It opens onto a small courtyard perpendicular to the actual street frontage, creating a busy clearing where valets sprint back and forth and cars dart in and out of traffic. Inside, under a low ceiling, a wall of patterned wood, curved in plan and painted blue-gray, conceals bathrooms and bends into the dining room. Guests are brought into the cavernous main room, with seating available in various stagings. Each arrangement is generously sized, complementary in color, and featuring unique illumination: a rail of cooler LED light along the banquette; large parabolic lanterns above a middle row; fabric shades against the board-formed concrete exterior wall. Yanes’ O-shaped kitchen loop is placed behind the L-shaped sittable bar, with support spaces and the walk-in freezer pushed to the far corner of the plan. 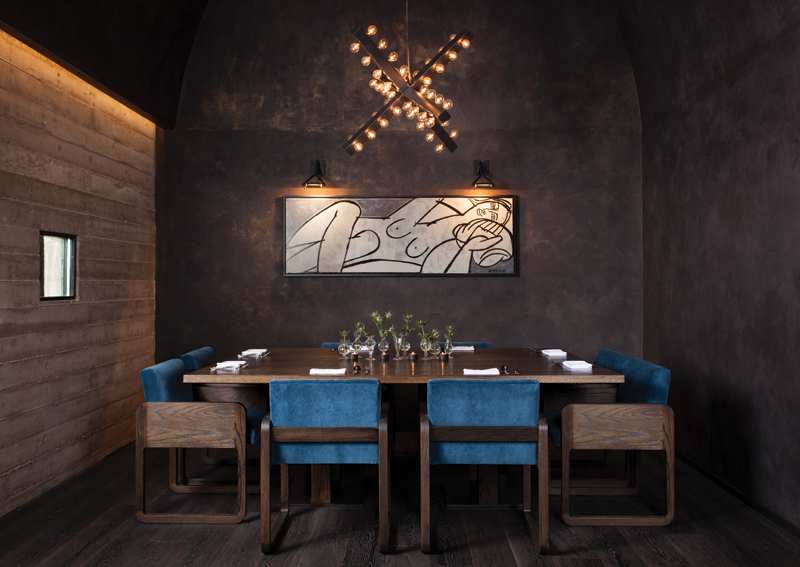 The establishment’s woody name resonates in the deep blue fabric of the banquette, the large mural of a scraggly namesake tree on a wood-paneled wall, the vase of Scottish thistle on the dining table, and the herbs atop the artful platings. Looking up, the blue plaster wave frozen above the kitchen succeeds as the most striking element in the room. It is a proscenium, brilliantly framing the kitchen stage below. In section, the curve registers above the body — soaring but not overbearing — as it forms a cloudlike backdrop to the tasty opera at hand. Sanders explained that a smooth-troweled finish was impossible due to the surface’s curvature, so instead it was expertly rendered by local plaster magician Sloan Houser in a vertically raked plaster with a mica mixture, causing the surface to quietly glimmer when uplit from its bottom steel cap. For both the restaurant and the menu, Yanes imagined small moments aggregated to generate a summed emotional result. Sanders, together with the talented Mark Cravotta, built in many such elements of curiosity. 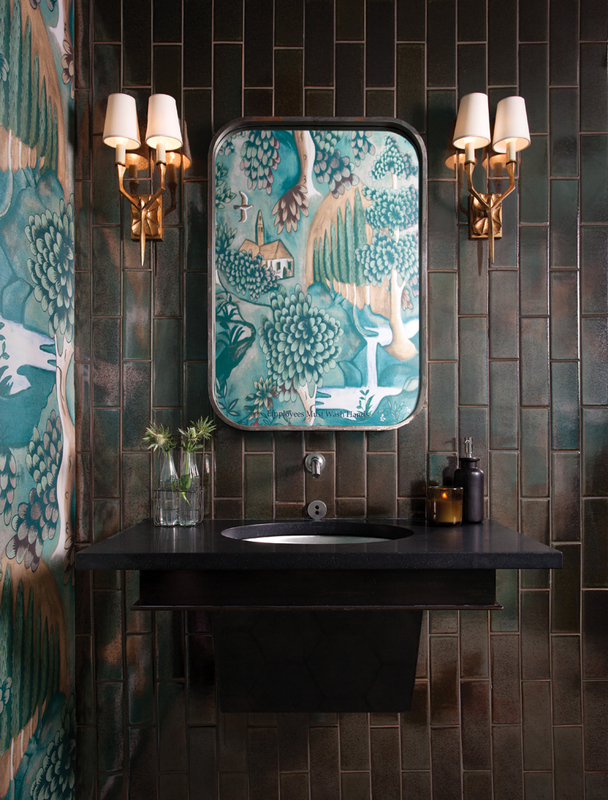 Each unisex bathroom is finished in a different darkly saturated but playful style. The private dining room has a vaulted ceiling in dark plaster, a form only perceivable once one is fully inside the space. The aforementioned bonzai-like juniper mural becomes visible once guests enter the dining room and look back toward the entry. A wall of bottles and cooking supplies is accessible from a cutely kinked rolling ladder, shaped to bend between countertop and the vent hood above. Outside, Juniper’s west-facing facade seen in bright light goes white, but when washed in noon rays shows its true blue coloration. 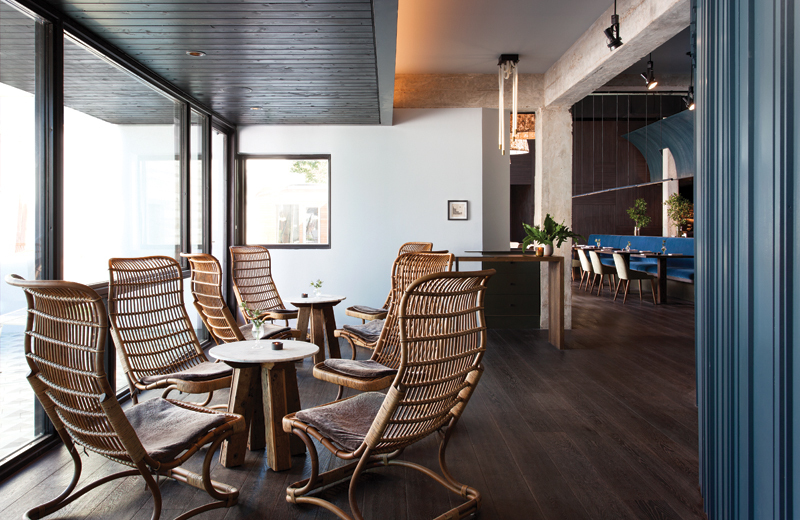 These constant surprises haven’t gone unnoticed, as the restaurant has enjoyed local acclaim in its first year of operation and was awarded an AIA Austin Design Award in 2016. Sanders said he was happy to create “a place where people can come and have an experience, [where it’s] not just about looking at the building.” This rang true for me when I dined at Juniper (bringing a partner along to help me conquer the menu). The selections, meant to be shared, begin with small plates and move on to pasta and larger items. Some offerings were inventive while others remained in safer territory, but all were executed with craft, especially the handmade pastas. The room started out empty but we were soon enveloped in a boisterous but amicable crowd, loud enough to feel bustling without roaring. On the sound system, Notorious B.I.G.’s “Big Poppa” — the back of the club sippin Moët is where you find me — and a playlist of other ’90s hits provided a chic date-night vibe. Conversation unspooled comfortably, with no staff hurrying to move these paying customers in the direction of the exit. When it finally came time for the milk + honey dessert, a cool prism topped with oats, we said yes: It was an offer we couldn’t refuse.